Is SweetiesSweeps a Scam? Read Reviews! Prizes: Beauty & fashion, books, cars and accessories, cash, computers & technology, electronics, food & household, gift cards, etc. 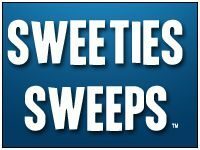 If you’re into finding sweeps to play, SweetiesSweeps.com certainly has an incredible selection of prizes though this is simply a posting site and you’re not playing for their prizes. With a tag line of “Win What You Can’t Afford” it certainly catches the imagination. I thought I’d found a real winner for once. SweetiesSweeps.com has a list of prizes that looks like it has it all. Then I started clicking around and kept hitting sweeps that had already closed. Next, was figuring out that most of them are only for people in the United States. Okay, there are a few that are open to other countries, but they are far and few between. Then there was the annoying pop up window that wants me to download something. This can get darn right frustrating. Each of the different sweeps available has different rules and regulations. This can include residency and age. Most of them seem targeted at North Americans, though there are some for Aussies and others. Some of them actually target specifically men or women. It’s time consuming clicking on each site to see if I could enter. Oh, there is a link for Canadians where there is a list of links where they can play, plus a bunch of other links for different giveaways. What Are the Prizes Offered by Sweeties Sweeps? I will say there are chances to win all kinds of prizes including beauty & fashion, books, cars and accessories, cash, computers & technology, electronics, food & household, gift cards, kids & toys, pets, sports & entertainment, and trips and travel. SweetiesSweeps.com has quite a range. The only problem is a bunch of them had already ended. So why are they still listed on the site? Wendy, who appears to be the owner says she brings years of expertise and offers this in her free book “Sweeping 101” which will help you win and give advice on being protected from scams. The only contact detail is a gmail account which started me wondering. You can contact “Wendy” if you have a giveaway you want to add. The important thing at SweetiesSweeps.com is to make sure you check out the specific terms and conditions for each prize you’re going after. They are all different including who can enter, what you have to do to enter and when the prize draw will take place. In some cases, you have to enter by using an Instagram, Twitter or Facebook account. Prizes all come from the specific sponsors. SweetiesSweeps.com simply facilitates the list of links of different sweeps you can enter. All prizes listed on this site must have a minimum value of US$25. There doesn’t seem to be any complaints and minimum feedback, though I’m not sure whether to read that as people are happy with the site or there is not a lot of people that use this site. I definitely am complaining about the pop up window that opens and wants me to download something each time I click on another prize site. Is SweetiesSweeps Scam or Legit? Hey folks, this is simply a link site for pulling together a heap of the sweepstakes. I found it incredibly noisy and wasted a lot of time trying to find a prize opportunity I could play. Would you mind rating SweetiesSweeps.com ? The busyness of the site does get wearing and frankly, the fact that I have to click on each individual site to get to the details on whether I can play or not is frustrating. Many of them are collecting information and/or getting you to view something. Add to that, the annoying window that pops up asking me to download a file each time I check another prize opportunity – forget it! If you are in the United States and have time to go through all the links to enter a prize, then this might get a thumb’s up by you. I give it a thumb’s down.